Ha, you thought this past weekend was cold in NJ? Ha! You Thought This Past Weekend Was Cold in NJ? 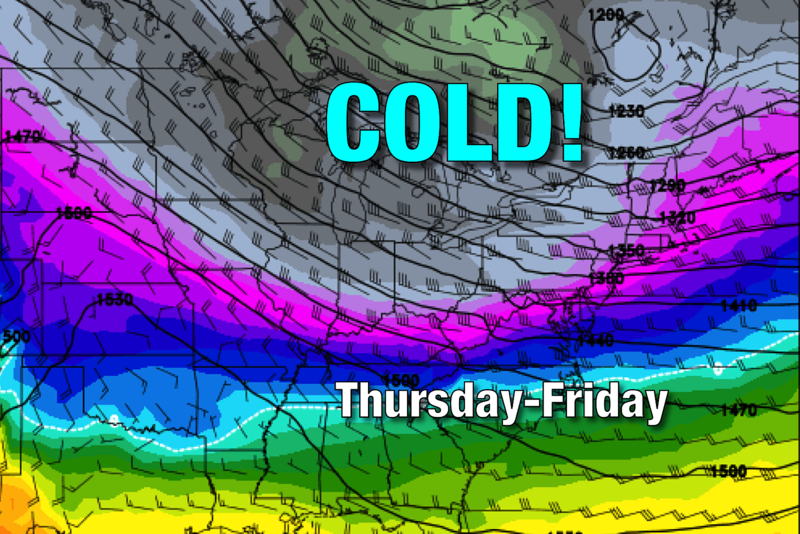 Just wait until Thursday and Friday, which could be New Jersey's coldest December days in over a decade. Compared to the frigid weather that will grip the Garden State later this week, the next two days will be quiet and fairly reasonable for mid-December. 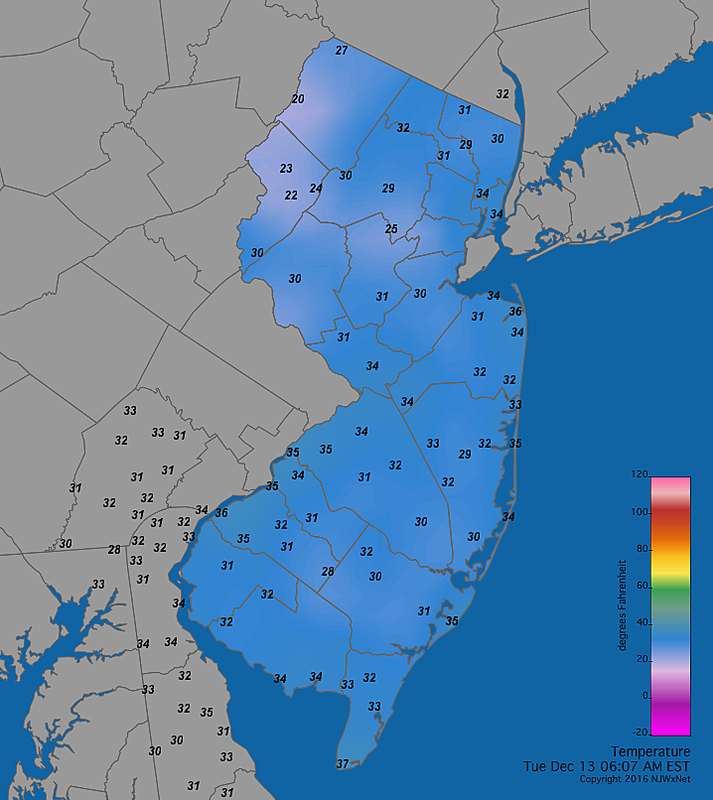 Morning temperatures have fallen to the lower 30s across most of New Jersey - a light freeze, and certainly cold enough for the formation for black ice and slippery spots. The areas with snowpack in Sussex, Warren, and Morris counties are starting the day remarkably colder, only in the lower 20s. Clouds will probably win the sky Tuesday, keeping temperatures a few degrees cooler than on Monday. High temperatures are forecast to be in the 40 to 46 degree range for Monday afternoon. New Jersey will be clipped by two weak shortwaves late Tuesday - one to the north and one to the southeast. That will present a chance for a shower on either end of the state from late afternoon through the evening hours. Could be snow, could be rain, will be light. I could see a light dusting to a half-inch of fresh snow falling in North Jersey if (and that's a big if) one of those showers really starts pumping out the snow. You can keep the shovels safely stowed for this one. Thermometers creep downward a bit more on Wednesday, with most highs in the lower 40s. The daytime hours will be partly sunny with a light wind. Once again, not bad for the middle of December. A cold front is scheduled to push through New Jersey Wednesday night through early Thursday morning. A light shower is possible, but the bigger story will be the intrusion of bitterly cold arctic air. 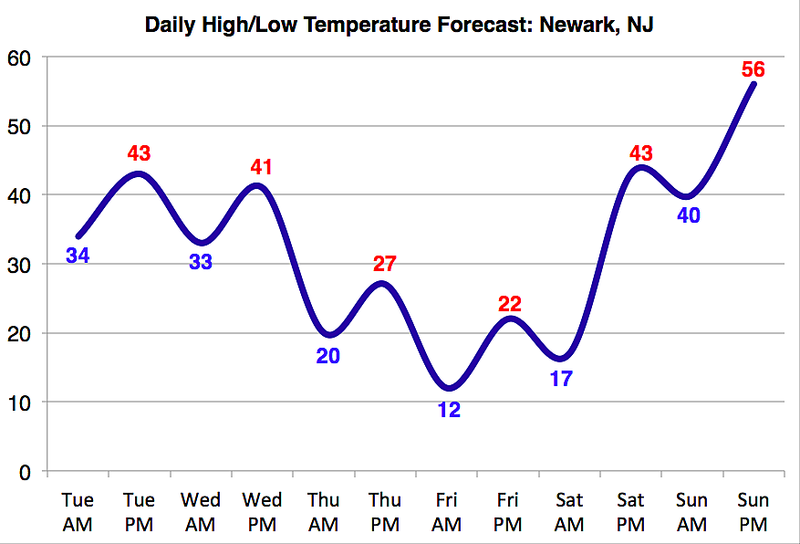 Thursday and Friday will almost certainly be New Jersey's coldest days since mid-February, and our coldest December days since 2004. Teens are possible Thursday morning, with statewide highs limited to the mid 20s. Add in wind gusts to 40 mph, and it's going to be a bitter, blustery day (to say the least). Temperatures bottom out Friday morning, with at least North Jersey falling into the single digits. But the thermometer won't tell the entire story, as wind speeds will remain elevated. That will push wind chills ("feels like" temperatures) below zero, probably for most of the state. In the coldest locale, the higher elevations of NW NJ, the wind chill could dip below -20 degrees. That is dangerous cold. With a wind chill of -24, frostbite can affect exposed skin within just 10 minutes. Schools may opt for a delayed opening. Cars (especially older models) will need some serious warmup time. And water main breaks are also common in such extreme cold. Friday's high temperatures will also be limited to the frigid 20s. At least skies will become sunny and winds will calm throughout the day. The early look at the weekend forecast shows a complicated and potentially messy setup. A pair of storm systems will affect New Jersey - one on Saturday, and one on Sunday. Depending on temperatures and timing, some wintry weather will be possible. The center of the first storm system will actually stay well north of New Jersey. That means we'll only receive a glancing blow, and will be on the warm side of the storm. (That's right, temperatures will crawl out of the basement on Saturday!) But we could still see some wintry weather at the storm's onset, around Saturday late morning. Prime time for this storms precipitation looks to be between 10 a.m. and 5 p.m. Saturday. It's probably going to be a similar progression as our last storm on Sunday-Monday: snow to sleet/freezing rain to all rain. It's still too early to tell if the freezing rain/icing is going to be a big concern or not. And still too early to determine what (if any) travel impacts we'll see across the Garden State. Just know the weather will be less-than-pleasant and potentially wintry on Saturday. We'll be watching this one carefully. By Sunday, we'll be fully entrenched in warmer air, with temperatures potentially soaring to near 60 in South Jersey. That means storm system number two of the weekend looks like a rainmaker. The current best timing also falls between 10 a.m. and 5 p.m. Behind Sunday's system will be another breath of cold air - luckily, not as severe and frigid as the Thursday-Friday blast. But it will be enough to return temperatures to "at or below normal" levels for early next week. Source: Ha! You Thought This Past Weekend Was Cold in NJ?